The workload is OTLP oriented ( most of the time ). The comment about eight cores per socket is based on the fact that with six cores per socket and two sockets I was unable to create any spinlock pressure of note. This does not preclude the fact you might have an application which is abusing the database engine or have encountered a SQL Server bug which is causing spinlock pressure. Is there a threshold which should trigger off a spinlock investigation ? If I was pressed to come up with a spin percentage of CPU cycles threshold for triggering concern into spinlock activity, I would say that this is 5% as a bare minimum. However, above and beyond this you really need to take into account the type of spinlock undergoing heavy spin and backoff activity. Under certain workloads high CPU utilization by certain spinlocks cannot be avoided. When buying hardware to run SQL Server at scale, go for processors with the fastest clocks available, the faster that single threads can run. If you are you consolidating multiple instances and workloads onto a server with more than one CPU, try to avoid configuring instances that cross NUMA boundaries, this saves the expense (in terms of latency) of spinlocks having to travel between NUMA nodes via the quick path interconnect. Check that your hardware has all the latest and relevant firmware updates so that the quick path interconnect is working as efficiently as possible. Minimizing the amount of time this spinlock is held for by reducing the amount of logging generated. Removing the CPU core that the log writer is using from the CPU affinity mask, this will be core 0 on either NUMA node 0 or 1. 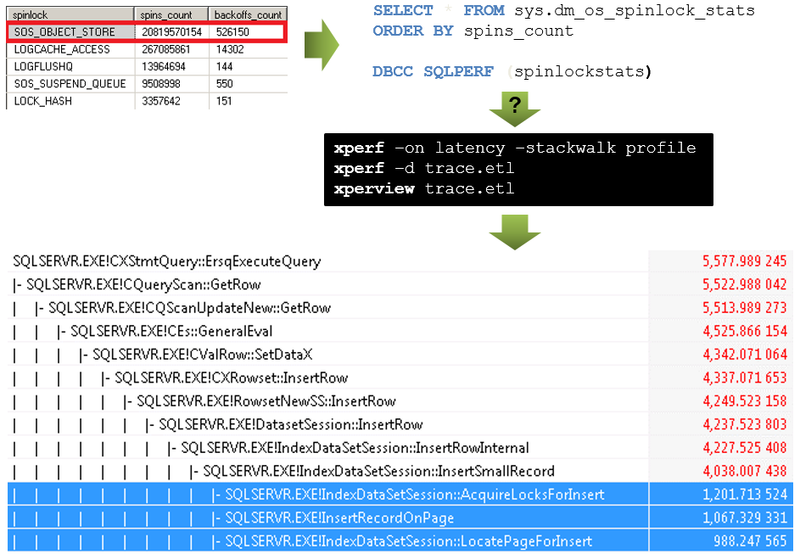 This spinlock is the ultimate bottleneck for any OLTP application that uses SQL Server and is used irrespective of whether or not the in-memory ( Hekaton ) engine is used or not. The IO sub system cannot drain the write queue as fast as it is being filled. 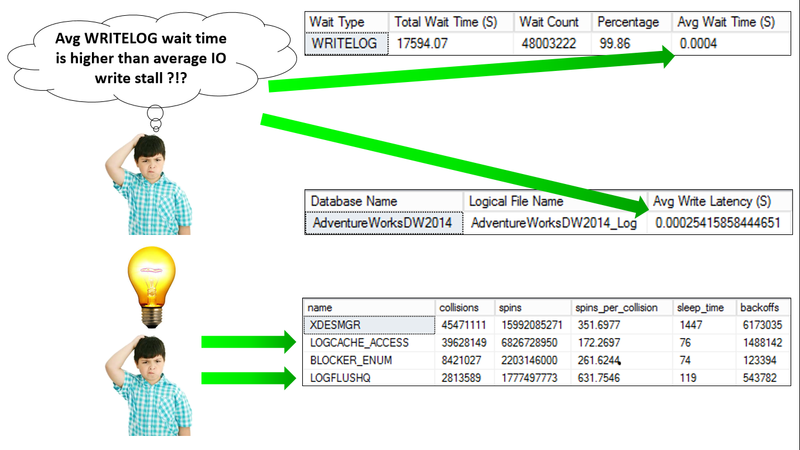 You are hitting the log writer pending IO limit; 32 prior to Server 2012 and 112 from SQL Server 2012 on-wards. ‘Shard’ the database(s) between SQL Server instances By doing this you are effectively partitioning the database across multiple log writer threads. Use SQL Server 2014 delayed durability The operation of a ‘Commit’ is decoupled from the logging information being written to disk, this only takes place once a full 60K portion of the log buffer is filled. I have seen this completely eliminate WRITELOG waits, however, it comes come at the risk of causing potential data loss. This protects the database engine mechanism which deals out transaction ids, relieving pressure on it is achieved by executing multiple DML statements per transaction or using table value constructors such that single INSERT statements can insert multiple rows. Access to the internal data structures associated with sys.dm_db_index_usage_stats and sys.dm_db_missing_index_stats is governed by this spinlock, it can be turned off by using trace flag 2330. Monitoring lock escalation The coarser grained a lock is the higher contention is likely to be on the hash bucket containing the lock, although this may not necessarily be directly behind heavy spin and back off activity on this spinlock, it will exacerbate the problem. Turning off page level locking Same comment regarding lock granularity applies. Checking that the application is not causing multiple sessions to update the same row by design. If multiple readers are reading the same row, consider using the NOLOCK hint or changing the isolation level to a version of read committed snapshot or serializable isolation levels which uses the row version-ing. This spinlock synchronizes access to the plan cache hash buckets. The use of object names which are not fully qualified will result in a search of the user’s default schema which is a longer code path and results in a greater number of spins on this spinlock. Image adapted from material borrowed from Thomas Kejser with his permission. I have covered some of the spinlocks ubiquitous with high CPU utilization problems. However, the raw data obtained from sys.dm_os_spinlock_stats has to be put into context of the workload type and the spinlock experiencing high spin and back off activity. 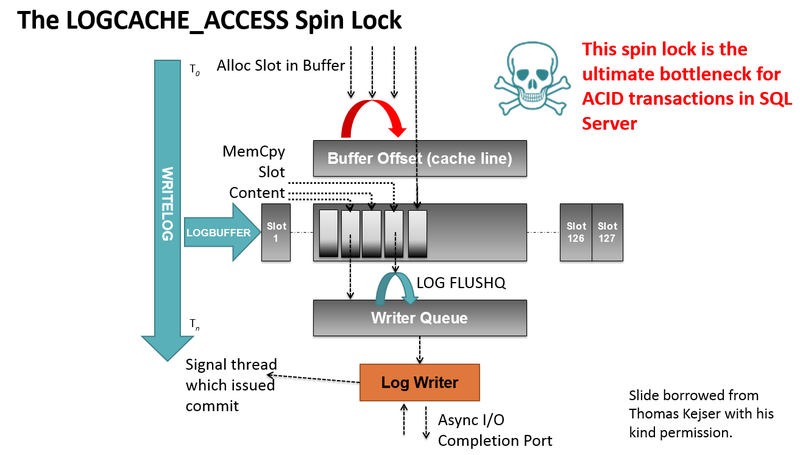 Problems with some spinlocks such as LOCK_HASH should be fixable most of the time, other spinlocks such as LOGCACHE_ACCESS may cause high CPU utilization when the database engine is under a sustained OLTP workload which cannot be avoided due to the nature of the beast that is . . . the database engine. https://wordpress.com/post/19345840/1143/ is protected by password. My Singleton insert blog post was protected by a password, its been visible to the public for a couple of weeks now. OK, the link in this post is broken but I found it using Google. Just the sort of advice I was looking for. Great that you produced this so soon after I had raised the question in your previously mentioned post. You are more than welcome, if there is anything else you wish me to blog, please give me a shout. Just wondering what the MUTEX spinlock indicates? I am starting to collect spinlock data and see this as one of the highest on SQL2012, both for a clustered instance and an availability group setup. To the best of my knowledge the MUTEX spinlock is associated with the execution of dynamic SQL. If we take a step back, are you see high and sustained CPU usage, also what is the nature of your workload, OLTP, OLAP, batch, a hybrid ? . . .
OLTP with some long running reporting queries on an availability group setup with a read-intent only secondary. We are thinking of making the secondary readable to offload the reporting queries. Are you max-ing out your CPUs ? Just starting to figure out the monitoring of spinlocks and when I need to worry, if at all. If you are hitting the performance requirements of your users, there is only value in squeezing every last drop of performance out of SQL Server if you want to extract the maximum value out of each core. You mentioned availability groups therefore its safe to assume that you are licensing SQL Server by the core as this is an enterprise edition feature. I like to get as much performance as I can as we keep adding more application databases and have limited data archival. Just trying to keep the ship steering straight with limited hiccups. If I can pinpoint a potential situation before it actually happens I will. Great !!! Finding all information in one place. Could you please let’s know the reason. Please more elaborate more. One of the first things the engine does when it starts up is to assign the log write to node 0 core 0 *usually*, unfortunately the only people who can provide more detail than this are the database engine team developers themselves.